Hyundai Heavy Industries Group said Wednesday it has completed the transition to a holding company structure through a stake sale and mergers among its affiliates, a move aimed at improving its governance. The world's largest shipbuilder by sales has pushed for the holding company structure since 2016 in line with the government's guidelines that encourage local conglomerates to strive for corporate transparency and competitiveness. "We have considered a variety of options ... amid unfavorable an business environment and have finally chosen optimal measures that meet the interests of shareholders and investors (in Hyundai Heavy affiliates)," Hyundai Heavy said in a statement. In separate board meetings Wednesday, Hyundai Samho Heavy Industries Co. decided to split into an investment firm and an operational business, while Hyundai Heavy Industries Co. decided to incorporate Hyundai Samho's investment company into its businesses, the company said. The split-off and merger allows Hyundai Heavy Industries to directly control Hyundai Mipo Dockyard Co. and Hyundai Samho Heavy, a major requirement of the group's move toward a holding firm structure. Formerly, Hyundai Heavy Industries controlled Hyundai Mipo and Hyundai Samho through other affiliates in a cross-shareholding arrangement. To resolve the complicated cross-shareholding issue, Hyundai Mipo sold a 3.9 percent stake in Hyundai Heavy Industries to Hyundai Heavy Industries Holdings in after-hours block trading for 318.3 billion won ($284 million), or 117,000 won per share, the statement said. After the stake sale, the holding company holds a 30.9 percent stake in Hyundai Heavy Industries. Hyundai Heavy Industries owns 80.54 percent of Hyundai Samho and a further 42.34 percent stake in Hyundai Mipo. 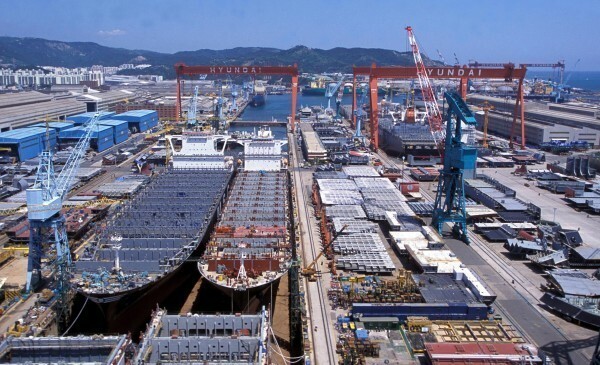 Under the holding firm structure, Hyundai Heavy Industries will focus on generating synergies among shipbuilding affiliates and strengthening competitiveness in businesses ranging from shipbuilding to oil refining in global markets, the statement said.